Today’s market conditions are constantly changing, and speed of change is going faster and faster. To be able to accommodate new technology like Artifical Intelligence, integrated value chains, sensor technology, self-driving cars, homes and your ever more important smartphone your choice of data centre and location becomes crucially important. Traditionally companies have looked to the larger hubs of users to establish their European data centres, and for some parts of your data load this will be important – but it is not in these hubs where innovation on in the data centre industry happens. That happens in traditional “newer” markets, where you have to be innovative to attract customers. This innovation we have taken to heart and built the most innovative and cost-efficient data centres on the planet. We know that you should have been ready in the market preferably yesterday and that you need a solution that you can grow with and that is why we have built flexible solutions that will fit your requirements today, but also tomorrow when you are a Fortune 500 – or if you are one today, and want to continue to stay there. We deliver flexible solutions, and we deliver them when you need them – on time and on budget. Cost of power is 50-75% less than most of Europe and can be fixed for up to 10 years, even if most of our clients choose variable spot as that traditionally provides lower cost over time. Cooling the data centre usually accounts for an additional 40-80% of the electricity required to power the servers. 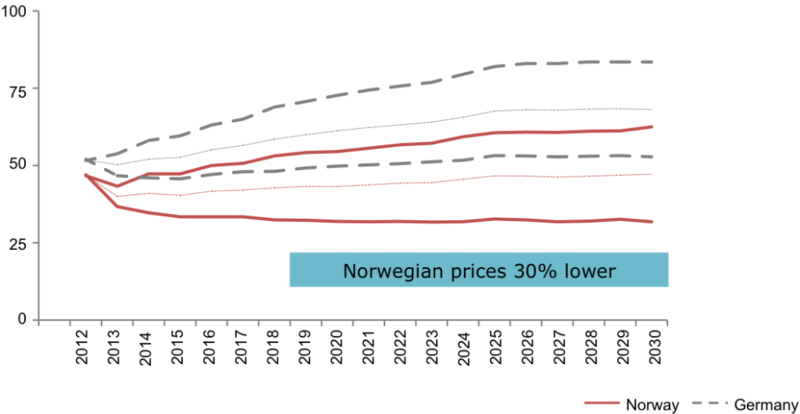 At Green Mountain, we use the fjords and the cool Norwegian climate as a cooling source and cooling is virtually ‘free’ adding only about 5% for the cooling load. Adding these two elements together on a 1000 kW server load clients will save £m’s over a five year period with predictable OPEX over that period because power prices can be fixed for up to 10 years. Green Mountain has agreed with Taxation Authorities an arrangement that secures, provided correctly structured that the offering is classified “a service” and can be invoiced directly to foreign clients without VAT, this also removes any risk of further taxation in Norway (details on request). There are no additional CRC/carbon payments on the electricity bill in our data centres. Green Mountain pays no business rates. This cost is usually passed on to tenants by other providers consequently there are potentially thousands of €/£/$ in savings for our clients. Together these elements and our efficient way of building your data centre will provide an optimal cost structure of service, where you as well as saving cost also have a data centre that is flexible and cater to demand. To deliver these services we have created a culture where operational excellence is at the core at everything we do. When undergoing the Uptime Institute certification we were as a new company able to learn from best practices and was able to implement these from the get-go. With these operational routines, we built an operational framework that is world class and has been incorporated into our Green Peak solution who recently won an award as the data centre project of the year in 2017. We are easy to do business with, and will always work to deliver on our committments. Our services are certified for several reasons, but also to secure compliance and re-certification of our infrastructure and routines. We have built a world class data centre, and a world-class data centre require world class procedures and an organization that follows them. That is also why we have built solutions that secure our clients 100% transparency into all parts of our delivery and can be monitored in real time in regards to compliance and to secure adherence to international regulations. In regards to low-risk, we deliver on our commitment and have a methodology to secure that every transition is delivered on time, to agreed quality at the agreed cost. We have a track record with client implementations that are 100% in accordance with these simple principles. The infrastructure we have built have also been 100% up since we started, and shows that our principles work – we wanted to build a state of the art data centre, and our track record of uptime during these first 5 years of operation shows that we have done so.